Everyone is welcome to join our club - you don't have to own a Speedster or Spyder - just share our enthusiasm for these wonderful cars. Club members pay a small annual membership subscription of just £20 to take part in a wide variety of club events and receive quarterly copies of the Club Magazine. Club members get discounts on insurance and other services and can place free 'Sales and Wants' adverts on this website. their cars in our 'Members Gallery'. Members can receive regular emails updating them with news and details of Club Events. We now have our own Facebook Group, and all car enthusiasts, are welcome, hoping that they will go on to join our Club. 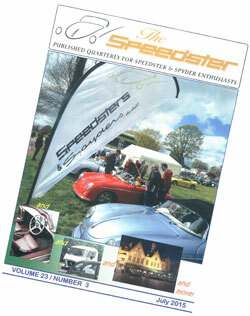 Members can place free adverts for cars or parts for sale or required on our Sales & Wants page or and are entitled to a FREE full page advertisement on speedsters.com (normally £35) - so in the sad event that they have to sell their car and leave the club - at least they can save more than their last year's membership fee! Membership of "Speedsters & Spyders - the Club" brings with it a very real feeling of 'belonging' and the knowledge that assistance, if ever it is needed, is just a phone call away, making use not only of the Club's Technical Gurus but also the regularly updated Membership List. When building a Speedster or Spyder or Coupe, fellow Club members are always there to help with advice and suggest modifications. The Club enjoys a high level of contact with suppliers and manufacturers. You can join the club by paying the £20 annual subscription and sending us details of yourself and your car. At the same time please download, complete and enclose our standard Membership Form with details about you and your car. You can also carry out the whole process online by clicking the 'Subscribe' button below and making a secure payment via our PayPal service which accepts most credit cards as well as PayPal payments. If you are a new member you must complete our online Membership Form to provide details of yourself and your car.